Were parents here at Epic Rentals and know how important it is to have a quality child car seat when travelling (especially in an unfamiliar country or area). That’s why we only use quality seats made by Britax. Here is a bit of information on the Britax Boulevard Car Seat that we have ready for your trip. The Boulevard pairs superior safety with best-in-class comfort to create an exceptional convertible car seat. SafeCell Impact Protection surrounds your little one in safety and advanced layers of protection. Complete Side Impact Protection absorbs crash forces and keeps your child’s head and neck secure. A tight and proper fit is made easy with the Click & Safe Snug Harness Indicator. 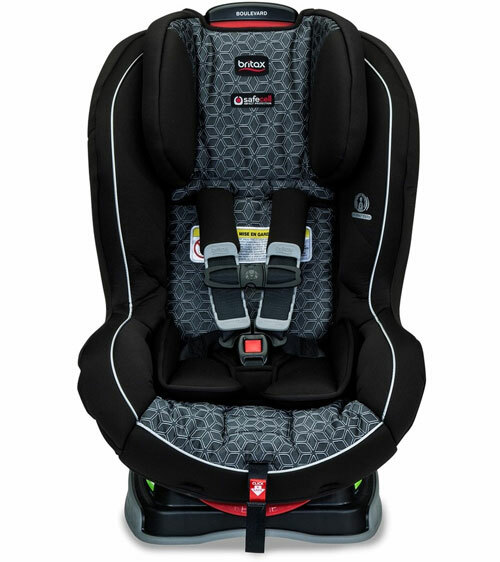 Base with SafeCell Technology® designed to compress in a crash, significantly lowering the center of gravity and counteracting the forward rotation of the child seat. Energy Absorbing Versa-Tether® features a two-point attachment and staged-release tether webbing to slow the forward movement and reduce the crash forces reaching the child. HUGS™ Chest Pads with SafeCell Technology® are affixed to the seat shell to ensure proper positioning while SafeCells compress to manage energy and provide resistance to the forward movement of your child in a crash. True Side Impact Protection® is deep side walls with energy-absorbing EPP foam along with a head restraint, which offers a double layer of EPP foam, to distribute crash forces, shield from vehicle intrusion, and contain the head, neck and body while keeping them “in true” or aligned. A tether strap is provided. Britax recommend using this when forward facing as it increases stability, however the seat has been tested both with and without using the tether, and it complies with the USA standard both with and without using the tether. It can therefore be safely used with or without attaching the tether.